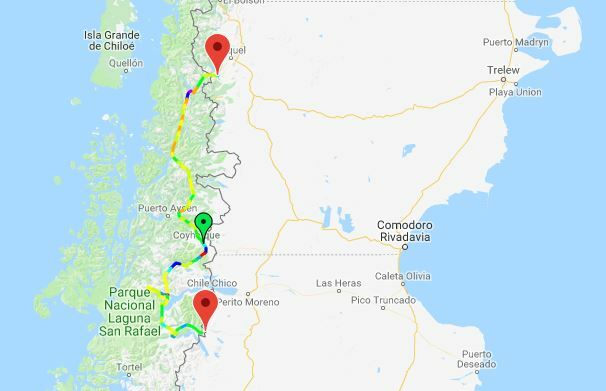 Carretera Austral is the legendary name given to the official Ruta (Route) 7 in Chile. The road runs from Puerto Montt to Villa O’Higgins. It exists entirely in the Patagonia section of Chile. The construction of the road started in 1976 and was one of the biggest infrastructure projects at the time in Chile. Unlike Argentina, on the other side of the Andes Mountain range, constructing a road south into Chile was not easy. Argentina had the flat plains to run the road along when the mountain terrain became to difficult. This is seen in the famous Ruta 40 in Argentina, which mostly runs along the easier, flat lands away from the Andes. Chile didn’t have this luxury meaning the stunning terrain is full of steep mountains, fjords, forests, canals and glaciers. Apparently, 10,000 army personal were involved in the roads construction, and when finished the road was completely dirt. Today work is underway to pave the entire length, a task that will take some time. Until then, enjoy the road before it becomes ‘too accessible’. Starts at Pueto Montt, Chile. As of 2017, it is in the process of being paved. Currently a mix of loose gravel and paved. What other Epic Rides are close by? The road to the Exploradores Glacier (Ruta X-728). The landscape here are some of the best in the world. Be prepared for lush forests, glacier topped jagged mountain ranges. the bluest of blue rivers. All this in one of the least population density places in the world. Enjoy the isolation. There are heaps of little towns to explore, also the road is famous for hitch-hiking, biking (both on cycles and motos). The Carretera Austral is ‘the’ Best Ride in South America. This is definition of Adventure Riding. It ticks all the boxes and more.